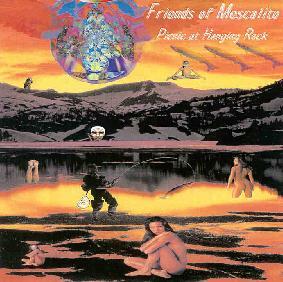 Friends Of Mescalito - "Picnic At Hanging Rock" / "Dark Darker Darkest"
Friends of Mescalito is yet another project from some of the folks of the W.O.O./World Of Tomorrow clan. Describing themselves as a psych/spacerock band from New York, the group is lead by Scott Prato on guitar and vocals and Mike Rose on bass. The two are joined by Mugsy on drums, Robbie Blender on guitar, Ian Brody on Korg, Dan Ghwatsky on sitar and piano, Greg Kline on percussion, and W.O.O. 's Bonnie Kane on sax and Ray Sage on drums. So do you like good old 60's garage styled freakout psychedelia? 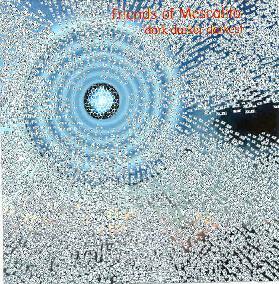 Well if you want to hear a current band playing this music then you could do no better than Friends Of Mescalito. "Awesome Machine Gun/Oh Man!" starts as a song and then blasts off into an acid-psych jam. Wailing wah guitar and a cool jazzy rhythm recalls psychedelia's best days combining totally trippy music with a good groove. "Invocation Of The Seeing Eye Gods" feels like an extended intro with its bubbling synths, gongs, tinkling bells, and a slow sitar lead. Very much like Gong. I was expecting to hear Daevid Allen chanting or Gilli Smyth to start her space whispers. "Water Reflected In Tar" is a cool rocker with the bass doing a bit of a Link Wray surfin' thing. And "Nyack Reprise" is an acoustic bluesy guitar piece not unlike those old Jimmy Page acoustic tracks. The album's title track, "Picnic At Hanging Rock", is a 30-minute suite based on the incident at Ayers Rock in Australia when a group of teenage girls were supposedly abducted by aliens. (I think there was a movie about this a few years back?) This is an interesting piece and is a little different from the other tracks. The opening segment reminded me of Pere Ubu or Red Krayola, though the band is still playing raw, but busy and fairly intricate jams. The subsequent guitars and sitar give the music it's trippy psychedelic feel, but I also hear rhythms and guitar that reminded me of Captain Beefheart. There's a cool sax bit that goes off on a kind of Didier Malherbe jam, a bit of pop-psych, and lots of great acid rock jamming. And the last several minutes include a total space rock 'n roll freakout. The Friends' second release, "Dark Darker Darkest", intentionally focuses more overtly on garage pop-psych and Nick Drake influenced tunes. On this release the band is still Prato and Rose, who are now joined by Cliff Ferdon on drums, and additional vocals by Kristie Rose. The disc has 9 songs and is slightly less than 30 minutes. Songs like "See Her", "Little Things", and "I Left My Lung Underwater" have a raw San Francisco folk-psych sound, and Lung Underwater includes a cool dual guitar acid jam at the end. "Dark Darker Darkest", and "Butterfly" are dark acoustic songs that reflect the Nick Drake influence on the band. The chorus to "Dark Darker Darkest" reminded me of the Stones' "10,000 Light Years From Home". "Pyramid At Night" was a standout track for me having a laid back acoustic Soft Machine feel. "Piece In The Lower East" is a bluesy acoustic instrumental. And finally, "Total Spacial Eclipse" is the Friends' "tip of the hat to Glissando Guitar rock for Daevid Allen & Steffi Sharpstrings". And that's exactly what it is. Very trippy, but it's just a 3-minute teaser. I'd like to hear a more extended jam of this stuff. Friends of Mescalito excel at playing, and often blending, 60's garage pop-psych and jamming spacerock, particularly on their first album. As the promo material indicates this is all intentional I'd say the band have achieved their goal. If I've aroused your interest then start with "Picnic At Hanging Rock" and go from there.